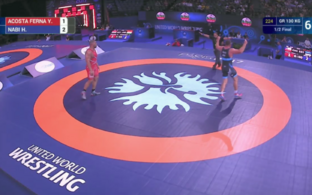 Two-time world champion and Olympic silver medalist Heiki Nabi lost 1-2 against Turkish Riza Kayaalp in Tuesday’s Greco-Roman finals of the World Wrestling Championships in Paris and won silver. Watch the video of the match above (commentary in Estonian). In his first match, Nabi swept France's Mathieu Lorentz 5:0. In the best of 16, the Estonian wrestler beat Iranian Shahab Morteza Ghourehjili 4:1, before going on to conquer Ukraine's Mykola Kuchmi likewise 4:1 in the best of eight. In the semifinal, Nabi beat out Cuban Yasmani Acosta Fernández, competing for Chile, 2:1. In the other semifinal match, Rio silver medalist and 2015 world champion Riza Kayaalp of Turkey likewise beat his Cuban opponent Óscar Pino Hinds of Cuba 2:1. Nabi earned the world champion title in his event in the 2006 World Championships in Guangzhou, China and again in 2013 in Budapest, Hungary. He also earned silver at the 2012 Summer Olympics in London, which makes the silver he won on Tuesday his fourth World Championships medal.